How am I feeling right now? Can we please start with a less complicated question? Five days ago I took a picture with my phone out of my bedroom window. I thought it was a nice picture of Liverpool and the River Mersey in the fog, but I didn’t really give it much more thought. I posted it on Instagram half an hour later with a direct link to Twitter. I soon got five or six retweets and I was very pleased with that, as I usually only get one or two on each picture I post. I actually texted a friend saying that I was getting a good response to a picture I had just posted. At that point I had no idea what was waiting me in a few more hours. I went on with my day and when the clock was around 5-6pm I thought I might as well post the picture on Facebook to see what my friends think of it. After that it all went mad. I didn’t realise how many people had seen it before I got a tweet from a coursemate who send me a link to profile who posted my picture, asking if that was the one I had taken. In the text above the picture it said: «nicked from Facebook». I was confused. How did she find the picture on Facebook? I wasn’t her friend and I couldn’t think any of my friends on Facebook who would have copied and posted the picture somewhere else. As soon as I realised the photo was ‘out there’ I started tweeting people saying that I took the picture. They believed me, luckily enough, and started spreading the word. Even though my picture was spreading and people had tried taking credit for it (which I found a bit annoying at first), when I’m looking at it now, knowing that most people know that I took it, I must say I’m taking it as a compliment that people wanted to take credit for something I did. That must mean that I have done something right. Shortly after the picture went viral, people started tweeting me saying how wonderful the it was. 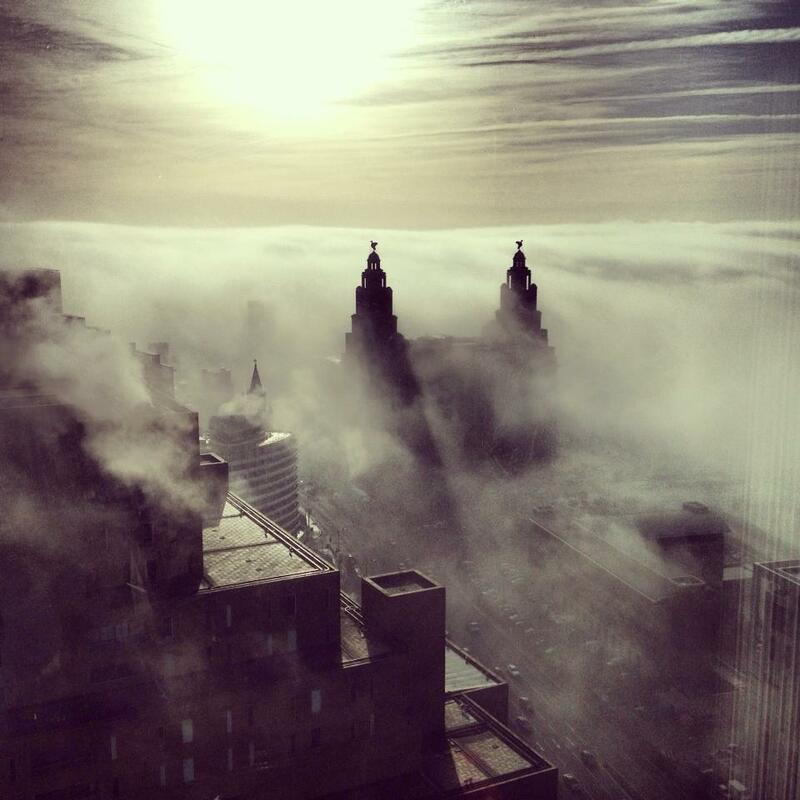 Some said it was the best picture they had ever seen of Liverpool. Others said it was the best they had ever seen, never mind the location. I received mentions on Twitter all night long, and for days to come. The same is true of Facebook and Instagram. The picture spread fast and pages on Facebook shared it, most of them without crediting me, but still. There were versions of the picture all over the internet. 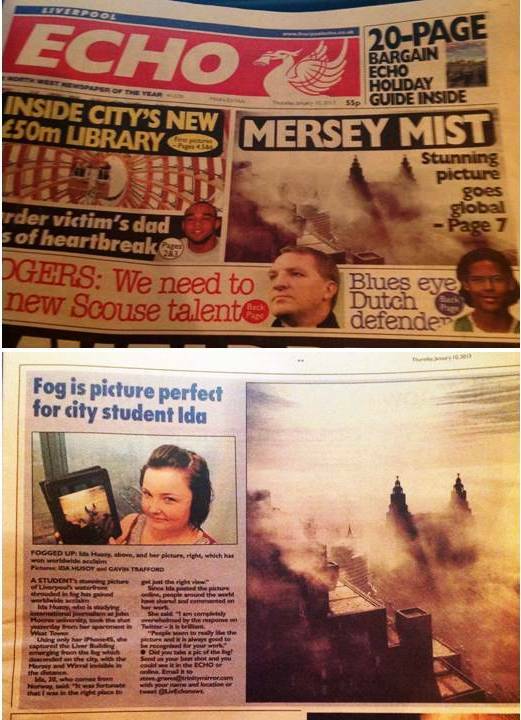 I found one Facebook page that had over a thousand people sharing my image and thousands and thousands of likes, as well as hundreds of comments.The day after it went off I had journalists on the phone all day, and it was featured in our local newspaper, the Liverpool Echo, as well as back home in Norway. I had press agencies who wanted to represent me and I was bombarded with requests from people who wanted to buy a copy of the picture on canvas. It was the kind of response you can’t really imagine unless you have experienced it and I’m still overwhelmed by the massive reaction to this picture. It’s been surreal, amazing, unexpected and fantastic. I’m not going to lie, it has also been stressful, but it’s still totally worth it. I can’t believe that I’m lucky enough to get the chance to experience all this. Yesterday was yet another milestone for me and the picture. 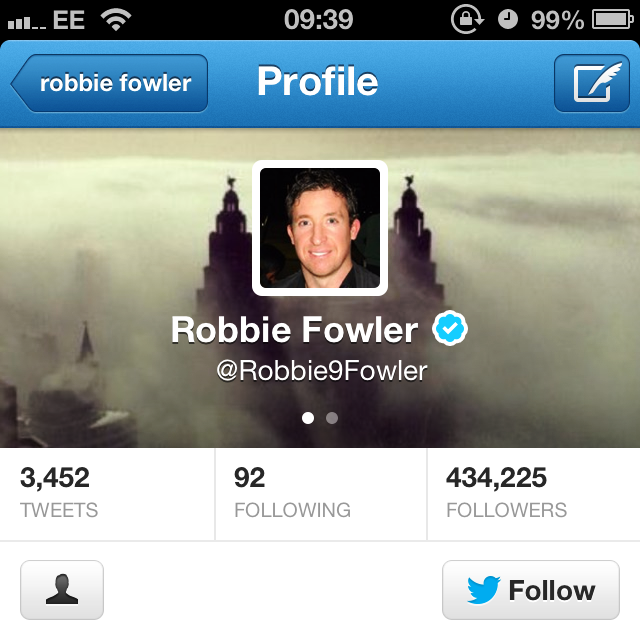 I realised that Liverpool FC legend Robbie Fowler was using my image as his cover picture on Twitter – a profile with more than 434,000 followers. I tweeted Fowler instantly to say thanks and he tweeted back saying it is a “quality pic”. As I’m a Liverpool fan, I’ll be more than happy to provide him with a printed copy if he wants to keep it. Later on the same day I got a tweet saying: “Did you know your photo is in today’s Telegraph?” I grabbed my jacket and ran down to the nearest shop and bought a copy. When I got home and opened it I could see a large print of my photo. 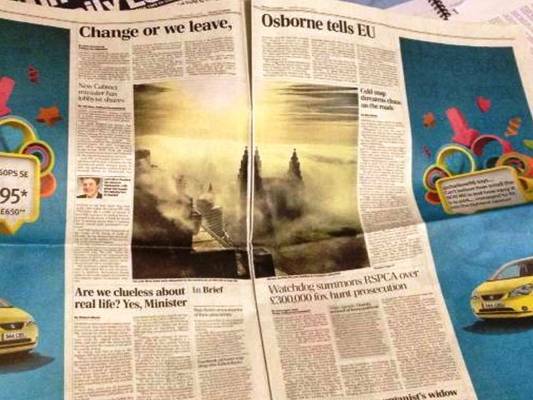 My picture, in the Telegraph! I’m still amazed by the power of social media and how word got spread so quickly. I’m struggling to believe that my picture has become so popular. On the first night after the picture went viral, my name was trending on Twitter in Liverpool, soon followed by JMU Journalism. Now I’m processing orders for canvas prints and looking into jigsaw and mug merchandise… and all this happened because I decided to take some pictures with my phone out of my bedroom window on a foggy Wednesday morning. Amazing picture, and absolutely incredible that this happened so quickly! Well done Ida!